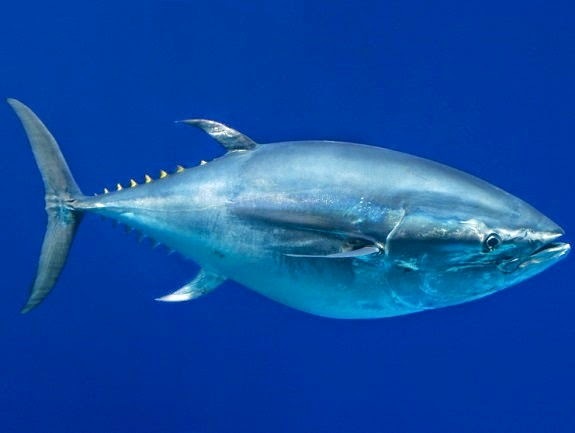 SYDNEY, Austrailia -- The Pacific Bluefin Tuna is moving towards extinction due to growing demand for the fish in the sushi and sashimi markets, the International Union for Conservation of Nature (IUCN) said today at the IUCN World Parks Congress taking place in Sydney, Australia. IUCN has moved the Pacific Bluefin Tuna (Thunnus orientalis) from the "Least Concern" category to "Vulnerable' on its Red List of Threatened Species, which means that the organziation believes the Pacific Bluefin Tuna is now threatened with extinction. The species is extensively targeted by the fishing industry for the sushi and sashimi markets, predominantly in Asia. A ccording to IUCN, most of the fish caught are juveniles which have not yet had a chance to reproduce and the population is estimated to have declined by 19 to 33% over the past 22 years.